These days it's starting to feel bitterly cold, which means I start going into hibernation mode instead of venturing out. Unfortunately my usual cocktail places are 25+ blocks away from my apartment. On this particularly cold day, I just couldn't muster up the energy to venture out. So instead, we made our own cocktails at home! We made our own Old Fashioned, which is a classic American cocktail and has minimal ingredients. You'll notice the ice cubes I use are unusually large - these are made using extra large silicon ice cube trays, which work great for cocktails because they melt slower and don't dilute your drink as quickly. Check out how I made it! *Simple Syrup is made by dissolving equal parts sugar in water. For 1/2 oz. of simple syrup, take 1 TB sugar and dissolve it in 1 TB of water. You'll wind up with a little more than 1/2 oz. of simple syrup so just discard the extra. In a glass, combine simple syrup, Angostura Bitters and Whiskey. Add an ice cube and stir with a stirring spoon (I don't have one but used a chopstick and that worked fine too!). 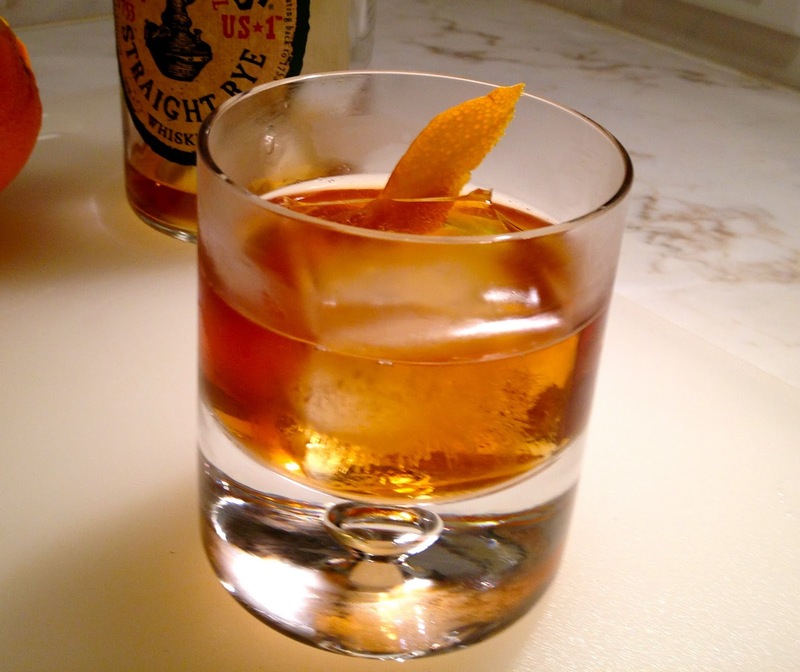 Place a large ice cube in an Old Fashioned glass (any short, wide glass will do). Strain the cocktail into your glass. Wipe the rim of your glass with an orange peel. Then twist the peel over the cocktail so that it releases some of the oils/aroma over your cocktail. Throw the orange peel into your cocktail and ENJOY! There you have it, it'll take you a matter minutes and you can enjoy it from the warmth of your own home. Give it a try and let me know what you think!